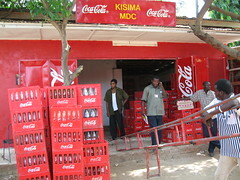 On 27/11/08 I was lucky enough to be able to accompany Benito Xaverly, one of Coca-Cola Kwanza’s Area Sales Managers as he visited 7 of the 17 MDCs he looks after. 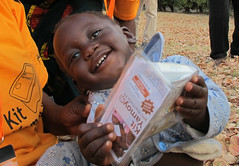 The main purpose of the visits was to agree the month’s sales targets and discuss any issues the MDCs may have. However, I took along the ‘ColaLife Pods’, the tube and the wedge, to test reactions to the overall concept of putting ‘social products’ into Coca-Cola crates and get opinions on the different ways of doing it. Here’s a summary of what we found. There is an insightful video of the conversation at Freeman MDC here. Click on the images to see them in more detail on Flickr. Please see the video of the conversation here.
. Discussion in 100% Swahili and a truck was being unloaded while we were there. Again the wedge was the preferred option with insertion of the wedge at the MDC the suggestion. I have a poor quality video of the conversation. Insertion of the wedges at the MDC was thought to be best. 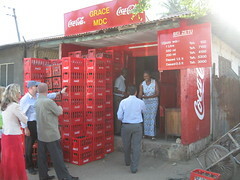 Everyone at the MDCs thought that the wedges were the best solution and everyone thought they should be put in at the MDC (not at the bottling plant). Although space at all of the MDCs seemed to be at a premium, everyone said that they would find space to store the wedges. Payment for insertion of the wedges was not talked about at MDCs 1 to 5 but MDCs would incur costs in doing this (eg storage, handling and insertion) and a payment would seem to be justified. I did discuss the possibility of payment at the Grace MDC (MDC 6 above) and that was greeted with enthusiasm: “When would we get paid? The same day?”. I said that I thought that payment would come when there was proof of delivery to the outlets. When I went to Grace MDC I was unaccompanied and made it clear that I did not work for Coca-Cola but was there at Coca-Cola’s invitation. This made the conversation much more cautious and the initial reaction to the idea was totally negative. “It’s a bad idea. 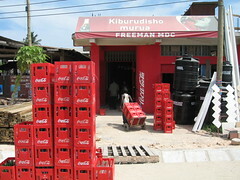 The only thing that should go in the crates is Coca-Cola”. However, when I explained that this would be done with the sanction of Coca-Cola (or not at all) and that the wedges would arrive on the Coca-Cola lorry the attitude changed completely. “No, this is a good idea”. So although the wedges would not be branded ‘Coca-Cola’ it would appear that the sanction of Coca-Cola is absolutely essential. 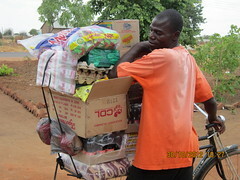 Mwenge South (which was tiny and had crates filled high everywhere) was shifting 230 crates a day. 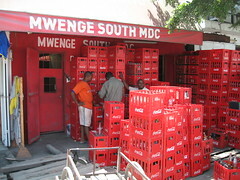 Generally speaking an MDC takes a whole truck load of crates. 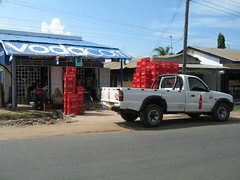 I a minority of deliveries is the delivery shared between two or more MDCs. Truck capacities are: 390, 520, 780 or 910 crates. 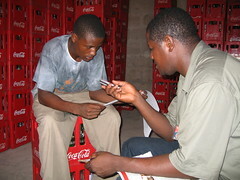 Thanks to Coca-Cola Kwanza for allowing me to accompany Benito and to Benito for being such great company.